Georginio Wijnaldum scored an absolutely brilliant lobbed finish for Liverpool this afternoon to hand them a 2-0 lead against Bournemouth at Anfield. The Reds were already 1-0 up thanks to a thumping header from Sadio Mane, with Wijnaldum’s finish later on in the first half doubling the home side’s advantage. 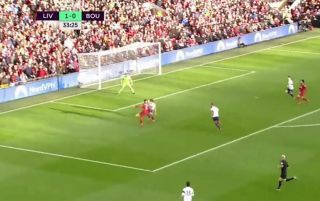 The goal came after a ball over the top from Andy Robertson was brought down by Wijnaldum, as the Dutchman lobbed the Cherries ‘keeper from around 10 yards out to hand the Reds a commanding lead. You can see the goal below. Sensational from the midfielder!